She Rolls Ground Beef And Cheese Into A Pizza Dough. What She Ends Up Making? DELICIOUS! It can be easy to get stuck in a food rut, eating the same things and never really being sure of what to make for dinner. If you’ve been feeling this way, try something new. This genius recipe combines two crows-pleasing favorites- tacos and pizza. These amazing taco pizza rolls are sure to become a new addition to your regular meal rotation. What’s there not to like about tacos packed into perfectly-portioned bites, after all? Optional topping such as lettuce, diced tomato, sour cream, diced onion, guacamole, hout sauce, etc. Begin by preheating the oven to 400°F and spray a baking sheet with a light layer of cooking spray. Cook the beef until it’s no longer pink. Then, add the taco seasoning and water, mixing thoroughly. Unroll the pizza dough onto a large, flat surface and flatten into a rectangle shape. 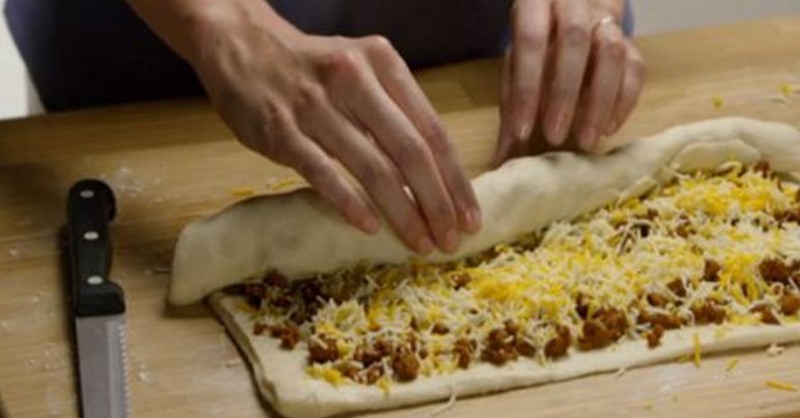 Spread the taco meat over the dough in an even layer and cover with cheese. Begin rolling the dough, starting with one of the longer sides of the rectangle. It should end up looking like a spiral from the end. Cut the roll into inch-thick slices with a sharp serrated knife. You should have about 18 pieces. Arrange the rolls on the baking sheet, and place them in the oven for 10-12 minutes, or until golden-brown. Then, just add whatever toppings you desire and serve. Not only are they adorable, they also taste amazing. The best part is, the entire process only takes about half an hour. For a full step-by-step demonstration, check out the video below.